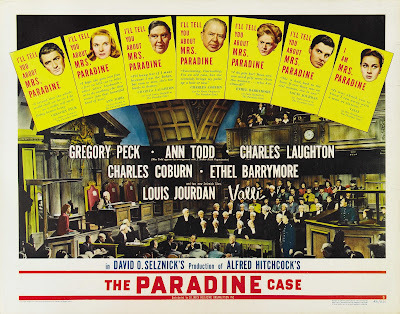 Today, I'm reviewing The Paradine Case (1947). Director Alfred Hitchcock's courtroom drama is about a mysterious woman (Alida Valli) who may have murdered her blind husband. This article is part of The Third Annual Barrymore Trilogy Blogathon hosted by In the Good Old Days of Classic Hollywood. In director Alfred Hitchcock's courtroom drama The Paradine Case (1947), the great actor Ethel Barrymore proved that she didn't need a lot of screen time to make an impression. Barrymore earned her third best supporting actress Academy Award nomination for playing the sympathetic wife of an English judge (Charles Laughton). The Paradine Case tells the story of Anthony Keane (Gregory Peck) an English barrister who is hired to defend the mysterious Maddalena Paradine (Alida Valli), who police believe killed her blind husband. Although Keane is happily married, he quickly becomes infatuated with the beautiful Mrs. Paradine. He goes to great lengths to prove her innocence even as the case against her grows stronger because of her inappropriate relationship with Mr. Paradine's handsome young valet (Louis Jourdan). The Paradine Case is based on a 1933 novel by Robert Smythe Hichens that producer David O. Selznick bought in 1933 in the hopes of actor Greta Garbo playing the leading part. Hichens inspiration for the character of Mrs. Paradine was the mysterious Swede, but Garbo turned the role down flat several times both before and after her retirement in 1941. 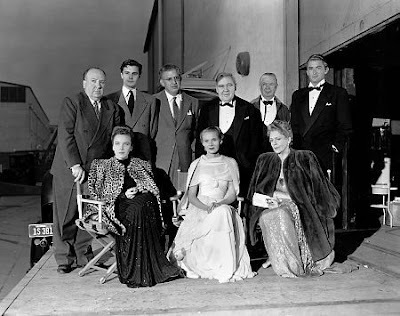 Finally, Selznick gave the project to Hitchcock who, while less than enthusiastic about the movie, agreed to make it so he could get out of his contract with Selznick. The director and producer, who were both independent-minded perfectionists, had a rocky relationship from the time they made their first film together (Rebecca in 1940) and not much had improved since then. Hitchcock and Selznick disagreed over the casting for The Paradine Case (Hitchcock wanted Laurence Olivier or Ronald Colman to play Keane; Selznick wanted and got Gregory Peck), and the director became increasingly frustrated with Selznick's almost daily rewrites to the script. Director Alfred Hitchcock (standing at left) and producer David O. Selznick (standing third from left) with the cast of The Paradine Case (1947). Standing from left are Louis Jourdan; Charles Laughton; Charles Coburn, and Gregory Peck. Seated from left are Joan Tetzel, Ann Todd, and Ethel Barrymore. Hitchcock feigned an attitude of indifference for most of the filming (Peck remembered that he often pretended to be asleep), but he did enjoy directing the courtroom scenes, which were filmed on a Culver City soundstage that was an exact replica of the Old Bailey in London. Hitchcock also experimented with long continuous takes and multiple camera techniques by shooting the courtroom scenes like a stage play with one camera trained on each of the principal actors. 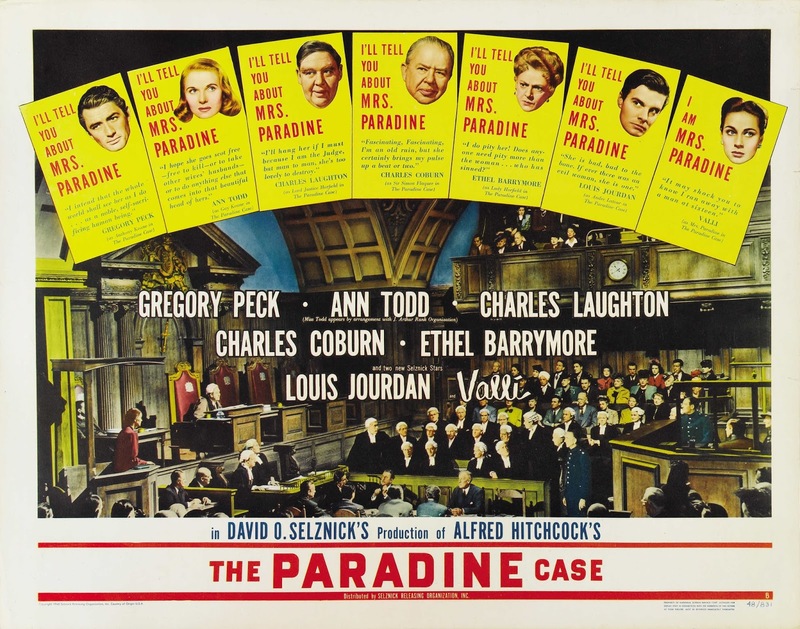 The Paradine Case was not a hit when it came out in 1947, and it isn't one of the best remembered Hitchcock films today. The plot is basically budget Agatha Christie and the love quadrangle between Todd, Valli, Jourdan, and Peck is uninteresting. However, the film's saving grace is the wonderful character actors who play the smaller roles. Both Charles Laughton as a martinet judge and Charles Coburn as a sympathetic solicitor give their usual fine performances, but the standouts are Hitchcock favorite Leo G. Carroll as a wily barrister and of course Barrymore, who plays Laughton's put-upon wife. She only has two scenes, but in those fleeting moments, she effectively becomes the moral center of the film, conveying more emotion than many actors do in a lifetime. 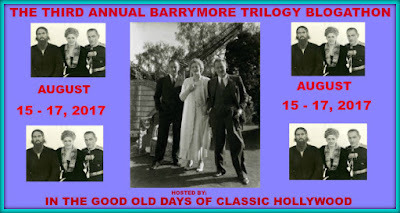 I wrote about Barrymore's Oscar-winning performance in None But the Lonely Heart (1944) for the first Barrymore blogathon, and I wrote about her Oscar-nominated performance in The Spiral Staircase (1946) for the second Barrymore blogathon. You have certainly done Miss Barrymore, and her Oscar winning/nominated roles proud. She is one of those actresses who always made it look so easy, so effortless. I find that most admirable. "Peck remembered that he often pretended to be asleep" --> typical Hitch! x) That's one of the rare Hitchcock's films I haven't seen, but you convinced me to see it asap. The cast is incredible!